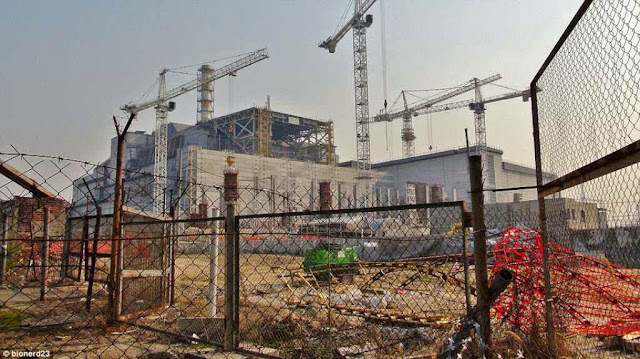 "Sampath Speaking" - the thoughts of an Insurer from Thiruvallikkeni: Daring Scientist Bionerd visits abandoned Chernobyl !!! 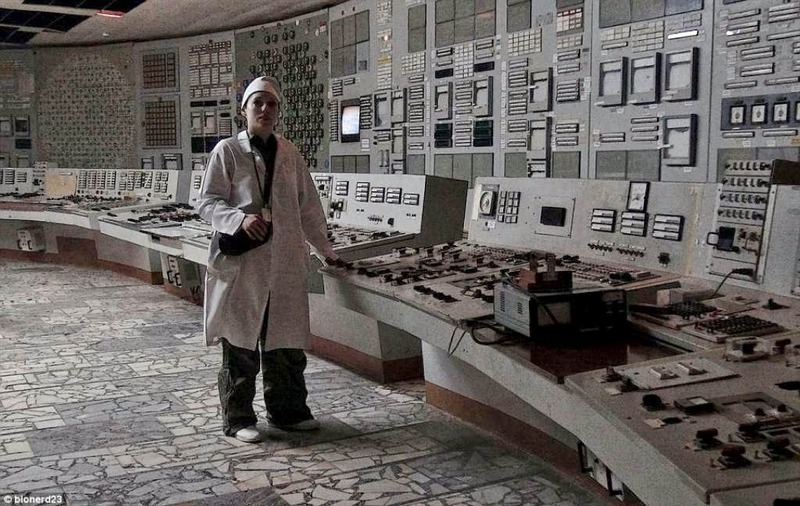 Daring Scientist Bionerd visits abandoned Chernobyl !!! This post is all about a woman Scientist ~not about her eating the forbidden apple though ! – you can see the tree behind overbearing apples and the forlorn giant-wheel. We have read about ghost towns in novels – at least one exists in reality for 29 years now after that fateful day of 26th April 1986. An explosion in the core dispersed large quantities of radioactive fuel and core materials into the atmosphere and ignited the combustible graphite moderator. That disaster endangered hundreds of thousands of lives and contaminated pristine forests and farmland with deadly radiation – putting fear on humanity in many other projects. The blast on April 26, 1986, spewed a cloud of radioactive fallout over much of Europe and forced hundreds of thousands from their homes in the most heavily hit areas in Ukraine, Belarus and western Russia. Chernobyl Exclusion Zone was set up by the Soviet military directly after the disaster and covers around 30km of the site, including the epi-centre of the blast. It is one of the most radioactively contaminated areas in the world - but there are still 197 'Samosley', or 'illegal residents' of the area who refused to move out. The Apr 1986 disaster is – ‘Chernobyl disaster’ a catastrophic nuclear accident that occurred at the Chernobyl Nuclear Power Plant in Ukraine (then officially the Ukrainian SSR), which was under the direct jurisdiction of the central authorities of the Soviet Union. The Chernobyl disaster was the worst nuclear power plant accident in history in terms of cost and casualties, and is one of only two classified as a level 7 event (the maximum classification) on the International Nuclear Event Scale (the other being the Fukushima Daiichi nuclear disaster in 2011). Time has effectively stood still in the Ukrainian city of Pripyat, which was evacuated in the aftermath of the 1986 Chernobyl nuclear explosion. It is stated that at the time of the disaster during the Soviet era, about 49,000 people lived in Pripyat, located less than two miles from the Chernobyl Nuclear Power Plant. They left behind schools, homes, factories, parks and gyms that have remained largely undisturbed for the past close to 3 decades. In Apr 2015, a 'superhero' scientist ventured into this - one of the most radioactive places in the world - scaling missile defence system towers, getting bitten by 'radioactive' ants and eating contaminated apples that have grown on trees close to Chernobyl's epicentre. Anonymous scientist Bionerd has attracted thousands of subscribers to her YouTube channel for her visits into the Chernobyl exclusion zone. Since the disaster the site has been closed off to the world, with Ukrainian scientists agreeing that the area isn't habitable for humans for at least 20,000 years. Despite this, the daredevil researcher claims she has exposed herself to more radiation swimming in the sea and visiting hospital - and says the most scared she's felt during her six visits was getting dangerously close to a rabid fox and walking by abandoned, dilapidated buildings. Bionerd uploaded pictures of her taken at Chernobyl power station on April 26, 2015 exactly 29 years after the disaster. She says she has exposed herself to more radiation going into hospital, and is more likely to develop cancer from swimming in the sea !! than visiting Chernobyl. Speaking to MailOnline Bionerd was not prepared to give her real name – because she feels 'Nobody should adore a scientist, one should adore his or her work' – but explains how she has come to 'love' the disaster zone. The 29th anniversary of the disaster was marked on Sunday, and it is still regarded as the worst nuclear power plant accident in history. Thirty-one people died in the direct aftermath, but the long term effects of the population living close by are still being investigated. 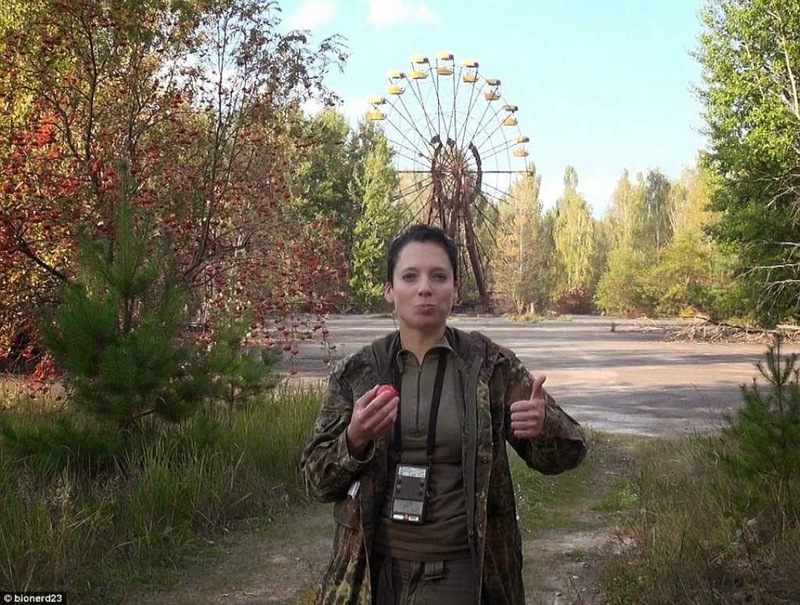 As well as conducting scientific experiments measuring the amount of radiation with her bright yellow Geiger counter, Bionerd's videos also show the eeriness of the once thriving and busy area, now abandoned and inhospitable. 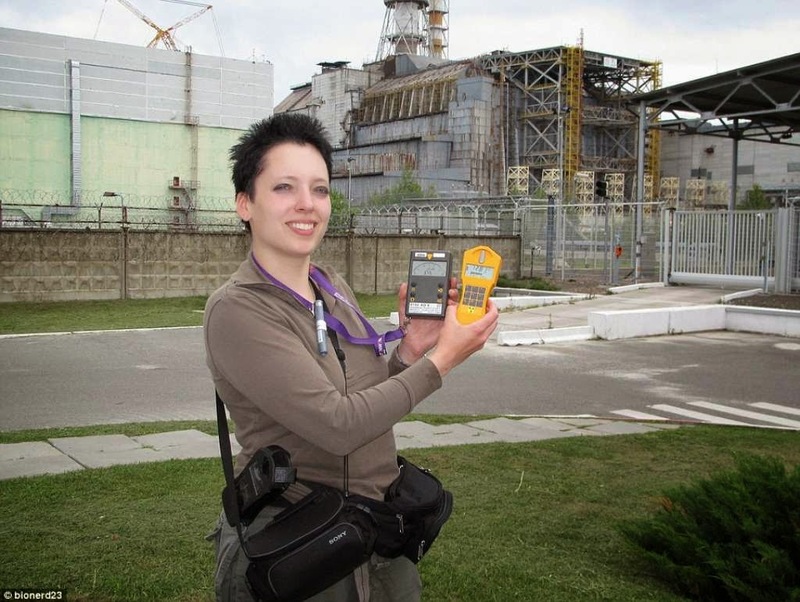 'The received dose of radiation [in Chernobly] was far too minor', she said. 'If anything, the medical procedures have exposed me to far greater amounts of radiation than Chernobyl ever will, so if I was to have a 'radiation induced cancer', I probably got it at the emergency room. She adds that being buried by a collapsing wall is the true physical danger there as is the rabies ridden animals. Bionerd says she wants a reliable energy source before shutting nuclear power plants... but after coal, it's still the second-worst source of power because of all that waste that is produced. Both the chemicals during separation and enrichment of uranium or spent fuel as well as the radioactive waste that results in the end of a fuel cycle are a huge issue. And while Bionerd's videos are rightly receiving praise from around the world due to their scientific content, many have flocked to praise Bionerd's punk style and good looks. ....... and do you know that tennis star Maria Sharapova of Russia, is a Goodwill Ambassador for the United Nations Development Programme (UNDP), with a special focus on helping with the recovery efforts after the 1986 Chernobyl nuclear disaster. “One of my proudest contracts ever,” said Ms. Sharapova after signing on for a symbolic $1 salary. Ms. Sharapova announced that she and her newly created private foundation would donate $100,000 to eight UNDP projects in Belarus, Russia and Ukraine that try to assist those areas still blighted by the Chernobyl accident.Ms. Sharapova became the sixth UNDP Goodwill Ambassador, joining the soccer stars Ronaldo of Brazil, Zinedine Zidane of France and Côte d’Ivoire’s Didier Drogba, the Japanese actress Misako Konno and Norway’s Crown Prince Haakon Magnus.